LaVonne: I grew up in the mountains of middle Washington state. I had horses and always a dog. My mother worked for the forest service. In the summer most weekends we were hiking and camping. We used a wood burning stove for heat and I chopped and stacked the wood. I would fill up a sled up with wood and drag it or push it from the shed to the house. In the winter I would have to carry buckets of water every day for the water trough. It’s no wonder Crossfit type workouts appeal to me! Sports, especially basketball was very big in my hometown. In the 4th grade learning the fundamentals of basketball was part of the curriculum. I played vollleyball and basketball starting in the 6th grade and all through high school. In the summer I also played AAU basketball. I was lucky and able to get scholarship playing basketball the first year of college. I moved to Florida in 1995. I met Matt in 2000, when Nathan was 3 yrs old. We were Married in 2001. I received both my BA and Masters Degree from USF. I currently work for Brown & Brown Insurance, as the Condo Division Manager. LaVonne: Matt and I have been training with Niels since before FitCrew, I think around 2005? Lifting weights was not really a focus for girls at my high school or college. It was not until Matt encouraged me to start working out with a trainer that I really starter doing weight trainer. I had always just done cardio. It wasn’t until I started training with Niels that I truly enjoyed it and achieved real results in increased strength and endurance. Denise: My fitness journey started out at West Bay. I ended up working out at Evolve in Palmetto, where I met Andrew and Niels. Andrew just took me under his wing and pushed me to always do more. When they finally opened up Fit Crew I followed them here. They’re like family. Andrew and I always just got along. When I got sick he was one of my biggest supporters. 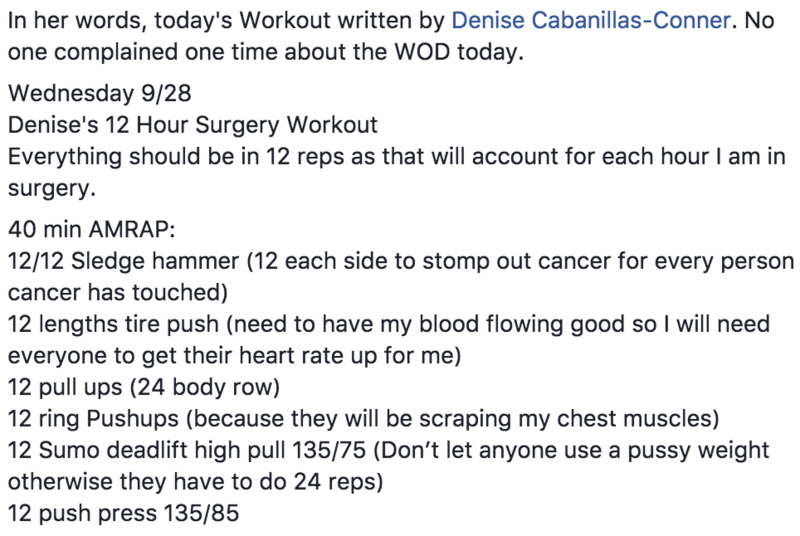 He organized Team Denise and let me write a workout the day of my surgery that matched the reps to the number of hours I had to be in surgery (twelve). He was amazing. Probably when I got six double unders in a row. I can’t do them right now but I have plenty of goals for 2018! Completing the DC 31 Miles for 31 Heroes August 2016 and August 2017. In 2016 I was invited by a Veteran to do the 31 miles ruck the week before the event. Of the 197 that started I was one of the 93 that completed the 31 miles which took 13+ hours to complete. Two months later, 10/13/16 I was diagnosed with breast cancer which required multiple surgeries, chemo and radiation. In 2017, my life revolved around recovering from multiple surgeries, chemo and radiation. When I was invited to go again in 2017 it was very important to me mentally to complete the 31 Miles again to prove to myself Cancer had not truly “changed” me and was no longer in control of my life. I had only 1 month to prepare but personal training with Niels 2 days a week in addition to 2 days of group classes had me ready. I completed the 31 Miles in quicker time and recovery. Least Favorite – Plank crawls or dumbbell pushup crawls. Me weakness is my lack of core strength. Denise: In general I love the variety of workouts weekly at Fit Crew. That being said, I’m not fond of the bear. My favorited would have to be the sled or bench pressing- I wish I could bench press every day. LaVonne: Niels and Andrew are the key. Not only are they elite trainers but they care about their clients. Plus, the core group that we work out with is encouraging and a lot fun to be around. We consider each other as friends and family. We support each other’s accomplishments and help when there is need. When I was diagnosed with cancer I received an overwhelming amount of encouragement and support. Fit Crew was a critical part in my mental health, not to mention my physical recovery. Two days after my double mastectomy surgery I had a 13 reconstruction surgery and I was in the hospital for a week. Doctors and nurses were all amazed at how well I looked immediately after the surgery and how quickly I recovered and healed. During chemo I was able to workout 3 of the 4 months of chemo. I had to stop working out only because my immune system was so low and I had no energy. Within two months I was back at FitCrew. I had limited side effects from the chemo and amazingly never came down sick with any colds or flu which is almost unheard of. I had a few more surgeries and each time I had to start over and get back “in shape” but because I had continued with FitCrew as best as I could each time was a little bit easier. The encouragement and support from my FitCrew family and the effects it had on me mentally is hard to express. When I walked into the gym each morning at 5am with little or no hair and I was greeted with smiles and fist pumps it set the tone for my day. I didn’t have to hide my condition and I was surrounded by people the really cared. How could I quit or feel sorry for myself when I had people that believed in me. If they saw it, it had to be true. Denise: The family atmosphere and camaraderie really make a difference; I truly enjoy the family atmosphere at Fit Crew. We’re all there to push each other, help each other with any weaknesses, and celebrate all of our strong points. With LaVonne developing breast cancer one month after I did and enduring the same long surgery we both feel that if it were not for being in the Fit Crew family, we could not have recovered as well we did. LaVonne: My passion and focus the last 2 years since we adopted Oz has been pet therapy. Both of our rescue dogs, ironically also both back left leg amputees are also therapy dogs. Oz and I, Matt and Paxton visit Bay Pines VA hospice and rehab patients monthly. Oz and I are also part of the Sarasota Manatee Association for Riding Therapy (SMART) program for Veterans with PTSD. In February Oz and I will begin pet therapy at John Hopkins Children Hospital once a month. While I was fighting cancer I started a non-profit Paws and Warriors to help Veterans with PTSD, TBI and/or physical injuries adopt rescue animals as Emotional Support Animals or companions with the hope some of these will transition into pet therapy teams to help others. I am also looking to include First Responders and Gold Star families in the group Paws and Warriors will support. Denise: Mark and I really enjoy time on our boat traveling the coast of Florida and beautiful sunsets when we are not working. Right at this moment we’re actually in Marathon on our boat for the holidays. LaVonne: I grew up in the town Norther Exposure was filmed, Roslyn WA.